Here is a patriotic log cabin quilt. I custom quilted this one. It has a neat bargello flag in the center area. I put a star/wave pattern in the diagonal white area. 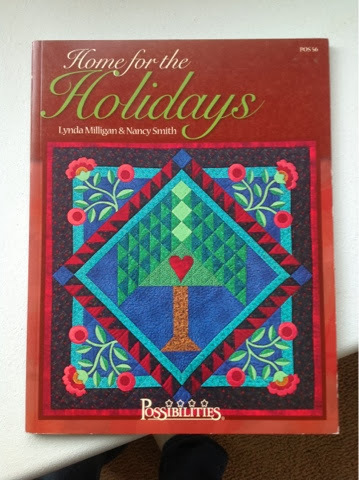 Recently I made the cover quilt from this book "Home for the Holidays". I tried to pick fabrics very similar to the pattern, as I really liked their color combinations. I used a fusible web on the appliqué, and a tiny zig-zag stitch with clear monofilament thread on the raw edges of the appliqué pieces. Sharing with you a picture of a pillow I made for a new baby. Some scraps of denim + some scraps of homespuns + a little fusible interfacing = a cute pillow. I started with a square of denim, and added some outer pieces like a big, chunky log cabin block. Just made a quick sketch of a dump truck, and some lettering for the name. Ironed them on & did a satin stitch around the outside, so it's washable. I have a case of 16" pillow forms that I got a long time ago, so I used one of those. The denim part has a zipper in the back, so the cover can be taken off & washed. I think it turned out cute for a boy.